Rockcastle Flowers operates 2 floral designs centers in the Finger Lakes New York area. 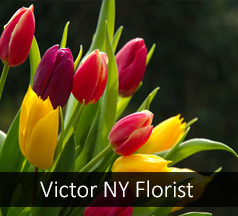 We offer same day and express flower delivery service in Victor and throughout Monroe County. Need to send flowers out of town? No problem. We also offer nationwide same day flower delivery service, anywhere in the continental United States. Beautiful farm fresh flowers, delivered right to the doorstep. Every arrangement comes with our 100% customer satisfaction guarantee.